Drafting a resignation letter can be a painful ordeal. You need to ensure that the content of the letter is smartly written and doesn’t hurt the sentiments of your senior or boss. To make it easy for you, we have a wide range of ready to use and pre-drafted Sample Letters to choose from. These drafts are easily editable, professionally drafted and can be printed or emailed. They are also available in a range of formats. The examples of resignation letter 2 weeks’ notice template have multiple pre-drafted resignation letters to choose from. Additionally, tips on how to edit the resignation letter in a positive manner have also been given here. 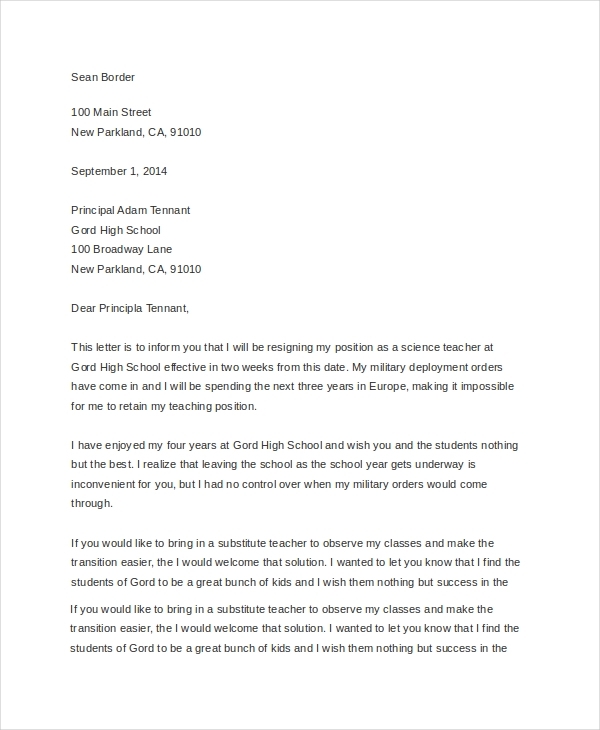 Teachers and professors of both universities and schools can use the teacher resignation letter example as a resignation letter. This letter has space for the user to add the address of the educational institution, the name of the principal, body of the letter and other information. 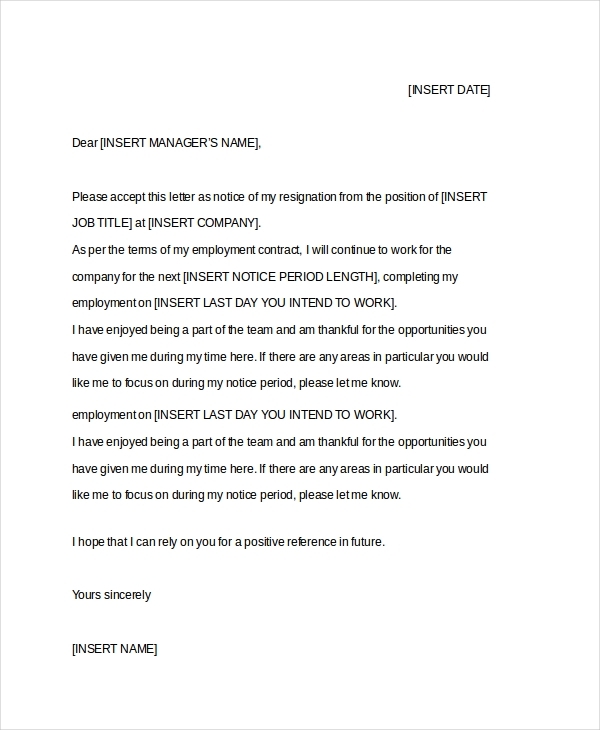 As the name suggests, this resignation letter is ideal for those who are looking to quit a job for personal reasons. 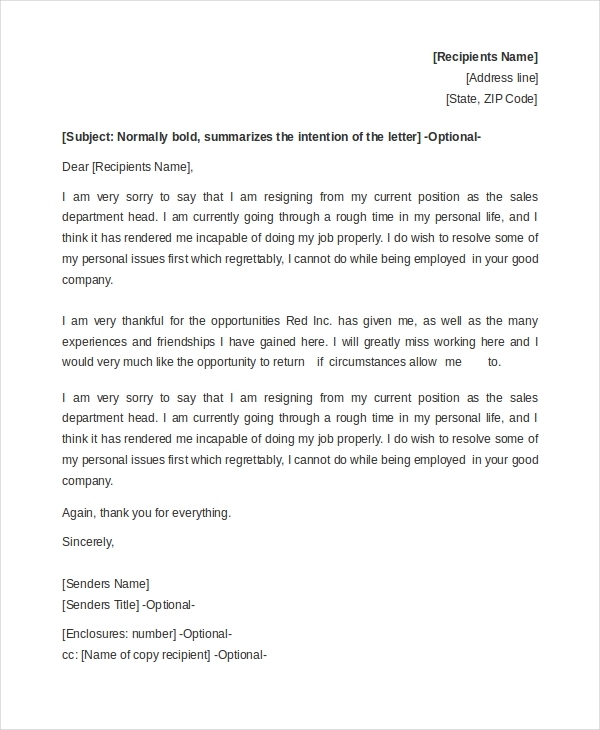 This template provides both guidelines on how to draft and edit a resignation letter, as well as a ready to use and easily editable sample letter. The retirement resignation letter is drafted taking into consideration the ill-health of the employee. This template is well drafted and will have a positive impact on the reader. It is also easily editable to suit the requirements of the user. 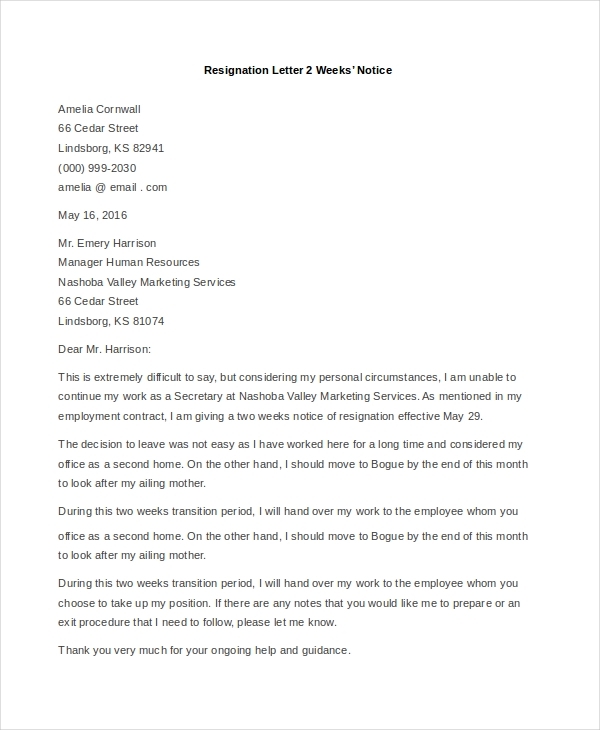 Employees from companies and organizations of small, medium as well as large sizes can use the standard resignation letter example. The template is available in both Word as well as PDF format. 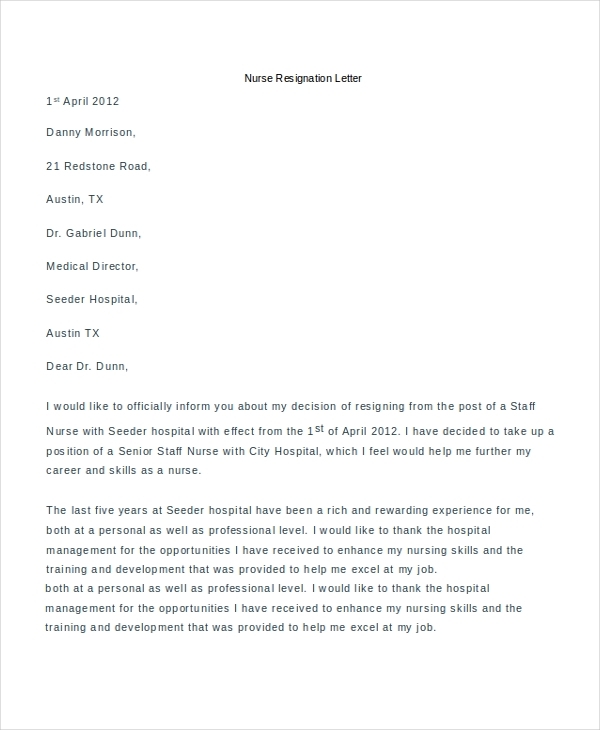 The nurse resignation letter example is ideal for nurses who are looking to resign from their jobs in hospitals and medical institutions. This link has a variety of differently drafted resignation letters to choose from. Target Audience of The Resignation Letter Examples? The target audience of the resignation letter examples includes employees from corporate organizations, teachers, nurses, bank managers, accountants, marketing executives, project managers, human resources executives, advertising heads and pretty much all kinds of employees from any types of organizations. What are The Benefits of Using The Resignation Letter Examples? 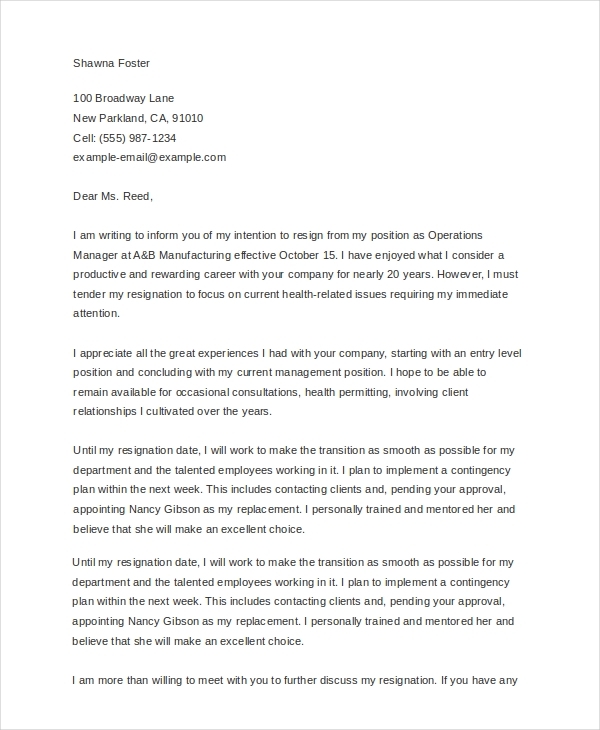 If you find that the company you’re working for is downsizing and you rather submit your resignation letter as opposed to receiving a termination letter, these templates are ideal for you. Just select one letter that best suit your requirement from the above-mentioned list, edit it, print it and submit it to your senior or boss.